A Golden Gate man who has spent almost 23 years tracking the Florida panther is stepping forward with claims of a bigfoot in the Everglades and a book in the works on the hairy beast. James McMullen, 55, is a naturalist and the author of a book on the Florida panther. He said that, in his years of tracking the big cat, he's had "unexplained encounters with physical evidence and unaccountable strange sightings of an unknown creature known as 'bigfoot.'" McMullen, who issued a news release on "the skunk ape phenomena" this week, joins Ochopee resident David Shealy, who has also publicly made similar claims of a bigfoot-like creature that roams the Everglades. Shealy's stories of the foul-smelling beast, which he calls a skunk ape, has attracted local skeptics and mostly tongue-in-cheek attention ranging from the Weekly World News to Comedy Central's "The Daily Show." For McMullen, he said his only bigfoot encounter occurred in the daylight sometime in August 1997, when he came across a nearly 7-foot, 500-pound hairy creature while tracking the panther in the Everglades. McMullen said he's seen numerous evidence of the bigfoot. He declined to reveal the exact location of the sighting, but the 30-second encounter took place in a remote area located south of Lake Okeechobee and north of the Ten Thousand Islands. McMullen said the sighting was located miles from Shealy's skunk ape sightings at Trail Lakes campground on U.S. 41 East in Ochopee. McMullen said that although he was unable to photograph the bigfoot, he began a research project to track the beast for more evidence, including collecting seven plaster casts of the hairy creature's tracks. McMullen said he decided to go public with his story after finding the best bigfoot track last month. He made a plaster cast of the five-toed, 14-inch footprint. "In essence, I have now gone public with my bigfoot project to help save him from extinction mostly because of overdevelopment and destruction of habitats that exist in critical areas of Florida," McMullen said. 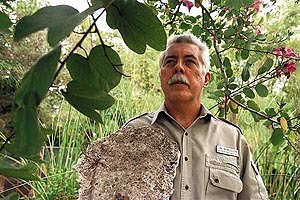 For several years, McMullen worked for the Big Cypress Nature Center and The Conservancy of Southwest Florida as a naturalist. McMullen's book, "Cry of the Panther: Quest of a Species," was a New York Times bestseller in the mid-1980s. "In my opinion, we have an unknown species that needs to be defined," said McMullen, who says he is not working for any special-interest group concerning Everglades restoration. McMullen noted that his current research involves trying to collect DNA evidence of the bigfoot, which he hopes will prove its existence. "It seems like people should know about this and how it relates to the environment," he said. But Florida Panther Refuge biologist Larry Richardson, who has met McMullen a few times, said he's not buying any of the bigfoot talk. "To me, it does not make logical sense that there is either a skunk ape or a bigfoot out there," Richardson said. "In order for us to have one animal out there, there has to be a population. If there is a population, then we would have roadkill or somebody would have shot one. If that's the case, we would have a specimen, but we don't. "On the other side of this coin, if we have an animal so smart that it doesn't get hit by a car or get shot, we need to bring him in and talk him into running for Congress," he added. McMullen said he's more than one-fourth into writing a book on the creature he calls "gorilla gorilla/homo erectus, a primate-like species that walks upright like a man." "I've got a super title for it, but I won't tell anybody what it is yet," said McMullen, who doesn't have a publisher for the book. The Streator, Ill., native, who has lived in Golden Gate City for 23 years, hopes to release the book by November 1999. He said the book will feature the history of the Everglades bigfoot, his experience and research of the hairy beast. McMullen said he has no plans to include Shealy's numerous accounts of the skunk ape. Shealy said he's known McMullen for several years and they talk regularly about the bigfoot. "We've compared notes," said Shealy, who again inquired about financial aid from the Collier County commissioners Tuesday. Shealy claims his business, Trail Lakes campground in Ochopee, is broke and his telephone has been disconnected because he can't compete with the nearby National Park Service, where campers stay for free. "He's (McMullen) been on TV with me," Shealy said. "We've tracked together. I support Jim McMullen in anything he does. He's right up there with the rest of my heroes." Jim Schortemeyer, a wildlife biologist with the Florida Game and Freshwater Fish Commission in Naples, said he's familiar with McMullen. Schortemeyer has read McMullen's book and has heard him give talks on Florida panthers before. "I didn't realize that he was involved in that (bigfoot)," he said. "Aside from the smile on my face that you can't see, I don't have any direct knowledge of Jim McMullen and the documentation he's found. "At this time, our agency is not spending any money into the documentation of a skunk ape or a similar creature in South Florida. To the best of my knowledge, there's no credible information to spend money on research." Nevertheless, McMullen said, with his credibility and work as an panther tracker, he's prepared for the skeptics who will try to debunk his bigfoot claims. "When you step out and go public like this, I don't know what it's going to be like," he said. "I would hope that they reserve judgment until after they read my book."